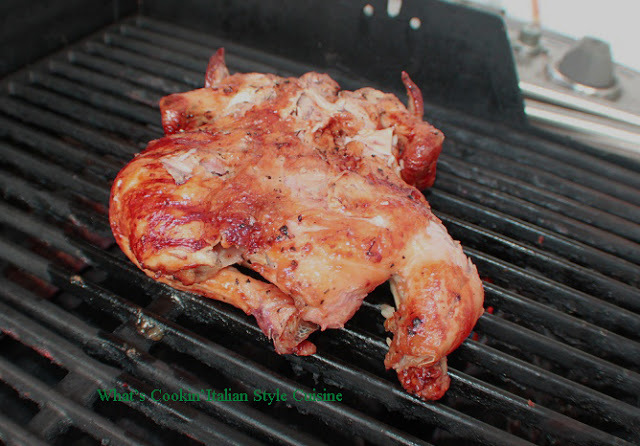 will enable you to grill the whole chicken evenly......... The chicken turns out moist and delicious. The rub really enhances the flavors when grilling. I highly recommend this method. Prepare chicken to marinade 8 hours or overnight. Mix all ingredient into a puree and rub under the skin and throughout the chicken internally. Refrigerate at least 6 to 8 hours. Heat grill to medium high heat. Using indirect heat. Place the chicken breast side down placing foil over the top and vent it. Grill until charred on one side (placing lemon slices on top or in the flap of the skin) around 15 to 20 minutes on one side. Flip and cook 30 minutes more adding more lemon slices. Flip again and using a meat thermometer checking until the internal heat is 165 degrees in the thickest part.